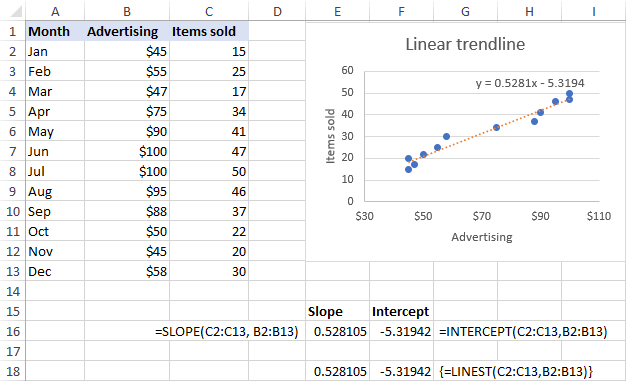 In this tutorial, you will find the detailed description of all the trendline options available in Excel and when to use them. You will also learn how to display a trendline equation in a chart and find the slope of trendline. 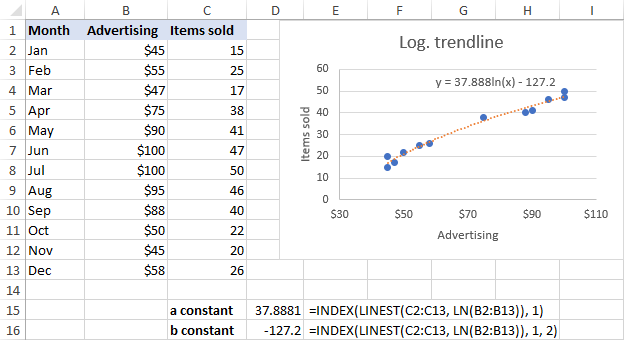 It is very easy to add a trendline in Excel. The only real challenge is to choose the trendline type that best corresponds to the type of data you are analyzing. 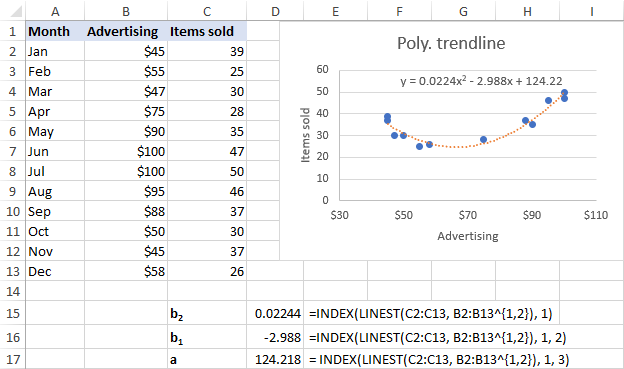 In this tutorial, you will find the detailed description of all the trendline options available in Excel and when to use them. If you are looking for how to insert a trendline in an Excel chart, please check out the above linked tutorial. Trendline equation is a formula that finds a line that best fits the data points. R-squared value measures the trendline reliability - the nearer R2 is to 1, the better the trendline fits the data. Below, you will find a brief description of each trendline type with chart examples. The linear trend line is best to be used with linear data sets when the data points in a chart resemble a straight line. Typically, a linear trendline describes a continuous rise or fall over time. 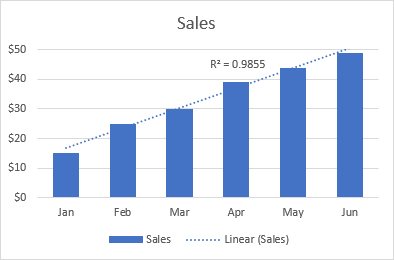 For example, the following linear trendline shows a steady increase in sales over 6 months. And the R2 value of 0.9855 indicates a pretty good fit of the estimated trendline values to the actual data. The exponential trendline is a curved line that illustrates a rise or fall in data values at an increasing rate, therefore the line is usually more curved at one side. This trendline type is often used in sciences, for example to visualize a human population growth or decline in wildlife populations. Please note that an exponential trendline cannot be created for data that contains zeros or negative values. 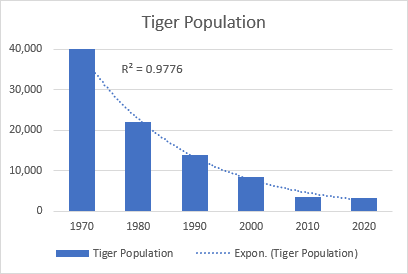 A good example of an exponential curve is the decline in the entire wild tiger population on the earth. The logarithmic best-fit line is generally used to plot data that quickly increases or decreases and then levels off. It can include both positive and negative values. 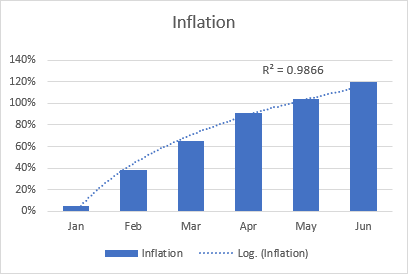 An example of a logarithmic trendline may be an inflation rate, which first is getting higher but after a while stabilizes. The polynomial curvilinear trendline works well for large data sets with oscillating values that have more than one rise and fall. Generally, a polynomial is classified by the degree of the largest exponent. The degree of the polynomial trendline can also be determined by the number of bends on a graph. Typically, a quadratic polynomial trendline has one bend (hill or valley), a cubic polynomial has 1 or 2 bends, and a quartic polynomial has up to 3 bends. 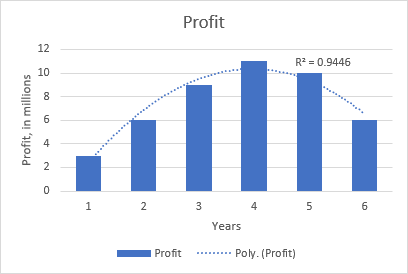 For example, the quadratic polynomial trend is evident on the following graph that shows the relationship between the profit and the number of years the product has been on the market: rise in the beginning, peak in the middle and fall near the end. The power trend line is very similar to the exponential curve, only it has a more symmetrical arc. It is commonly used to plot measurements that increase at a certain rate. 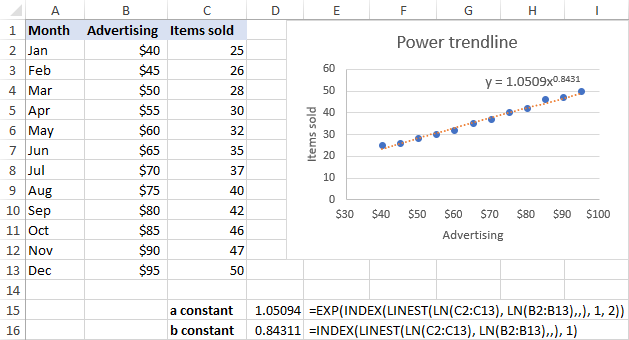 A power trendline cannot be added to an Excel chart that contains zero or negative values. 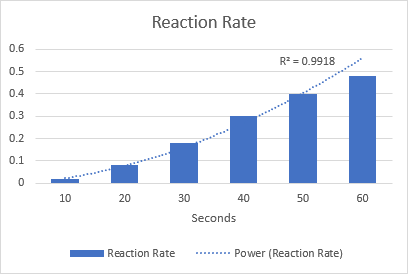 As an example, let's draw a power trendline to visualize the chemical reaction rate. Note that the R-squared value is 0.9918, which means that our trendline fits the data almost perfectly. When the data points in your chart have a lot of ups and downs, a moving average trendline can smooth the extreme fluctuations in data values to show a pattern more clearly. 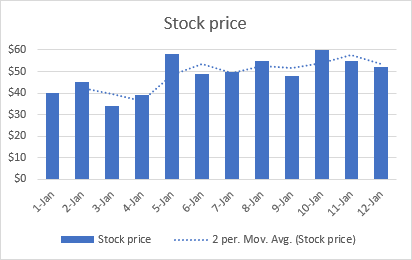 For this, Excel calculates the moving average of the number of periods that you specify (2 by default) and puts those average values as points in the line. The higher the Period value, the smoother the line. A good practical example is using the moving average trendline to reveal fluctuations in a stock price that otherwise would be difficult to observe. For more information, please see: How to add a moving average trendline to an Excel chart. This section describes the equations that Excel uses for different trendline types. You do not have to build these formulas manually, simply tell Excel to display the trendline equation in a chart. Also, we will discuss the formula to find the slope of a trendline and other coefficients. The formulas assume that you have 2 sets of variables: independent variable x and dependent variable y. In your worksheets, you can use these formulas to get the predicted y values for any given values of x. For consistency, we will be using the same data set with slightly varying values for all the examples. However, please keep in mind that it's only for demonstration purposes. In your real worksheets, you should choose the trendline type corresponding to your data type. Important note! The trendline formulas should only be used with XY scatter charts because only this chart plots both x and y axes as numeric values. For more information, please see Why Excel trendline equation may be wrong. b is the slope of a trendline. a is the y-intercept, which is the expected mean value of y when all x variables are equal to 0. On a chart, it's the point where the trendline crosses the y axis. For linear regression, Microsoft Excel provides special functions to get the slope and intercept coefficients. Where a and b are calculated coefficients and e is the mathematical constant e (the base of the natural logarithm). Where a and b are constants and ln is the natural logarithm function. Where b1…b6 and a are constants. Depending on the degree of your polynomial trendline, use one of the following sets of formulas to get the constants. 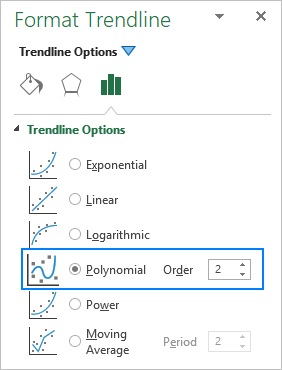 The formulas for higher degree polynomial trendlines can be built by using the same pattern. If you think that Excel has drawn a trendline incorrectly or the trendline formula displayed in your chart is wrong, the following two points may shed some light on the situation. Excel trendline formulas should only be used with XY (scatter) graphs because only in this chart type both the y-axis and x-axis are plotted as numeric values. In line charts, column and bar graphs, numeric values are plotted only on the y-axis. The x-axis is represented by a linear series (1, 2, 3,…) regardless of whether the axis labels are numbers or text. When you make a trendline in these charts, Excel uses those assumed x-values in the trendline formula. 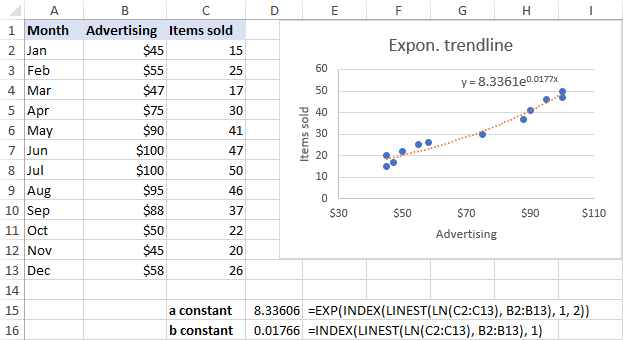 To occupy less space in the chart, Excel displays very few significant digits in a trendline equation. Nice in terms of design, it significantly reduces the formula's accuracy when you manually supply x values in the equation. An easy fix is to show more decimal places in the equation. Alternatively, you can calculate the coefficients by using a formula corresponding to your trendline type, and format the formula cells so that they show a sufficient number of decimal places. For this, simply click the Increase Decimal button on the Home tab in the Number group. That's how you can make different trendline types in Excel and get their equations. I thank you for reading and hope to see you on our blog next week!